The original version of Charlie and The Chocolate factory might be the movie I have seen more than any other movie in the world. I am sure it is close with Emprie Strikes Back, Ferris Bueler's Day Off, and Adventures in Babysitting. However I watched this movie not becuase of a love for it, but becuase my mom always put it on. I know every word to every line in that movie. I have more of a hatred than a love for it now, but I do not know if I really do hate it, as it truly is a story that I feel was part of my life and was a story for me. Warp to 2005, things are different, Tim Burton, a man whom has some movies which I consder some of my favoirties and some I thought were terrible. Johnny Depp, took the part from Marylin Manson. And Warner Brothers throwing a lot of money into it. Would it be good, be bad or just terrible? I don't know, even now, what the answer to that question is, it is good in some places and just not in others. I guess lets start with the good. Which is oddly almost everything, it is hard to explain, but I will try. This movie was alive with everything. The characters were almost all perfect. Charlie Bucket, Grandpa Joe, Violet, Veruka, Ogustas and Mike Teevee, were all soo soo great. All the supporting roles were excellent and the man playing the Ommpa Loompas was pretty funny too. I though all the kids were all wonderful choices and really displayed what they were intended to display and I liked them very much. 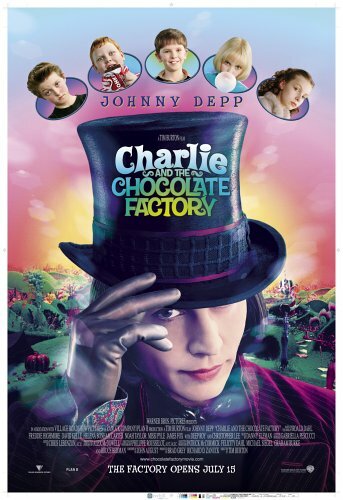 Willy Wonka however…was not that great. A basketcase wacko with a mean streak that was frabricated or put up for show, really didn't seem to work. More of an idiot savant that a reclusive genius made Willy himself to not be an amazing man with an amazing plan, but instead like rainman, put into a situation where he would excel and did so. It made him such less of a figure than he was I think in the original. And that was a bit of a let down. The sets were grand and spectacular, Tim Burton and his set design crew really did it up right. Even Charlie's run down shack had an amazing feel that really was part of everything in the movie and did well. The factory was great I felt. Very big, amazing, and fun. I liked it. The costuming also kept in with a solid theme that seemed to work very well. The story was good nearly the same with a little bit more attached to the end. The little bit more made it a different story and changed it up and more about Willy than before. I am not sure if I did or did not like this. It was different, and change always will throw people off. I think I could have done with a little less of the new story, but overall it wasn't so bad. So overall it sounds pretty good. So what was the problem? I am not sure if I figured it out, but I think what it was, was a coldness to the whole movie. It didn't seem like anyone put in any heart into it. It wasn't a movie to tell a story, it was cranked out to make money, and it just felt that way. It felt hollow. Empty. Cold. I didn't get that amazing feel of wonderment walking into the choclate factory, or seeing Mr Wonka. I didn't see the joy of winning a choclate facotory or anything else. It seemed so corporate and just didn't touch as close to the heart as the old one did. And the Ommpa Loompa songs were very low volume and not very good. So overall I would say go right down the middle, and say rent it.